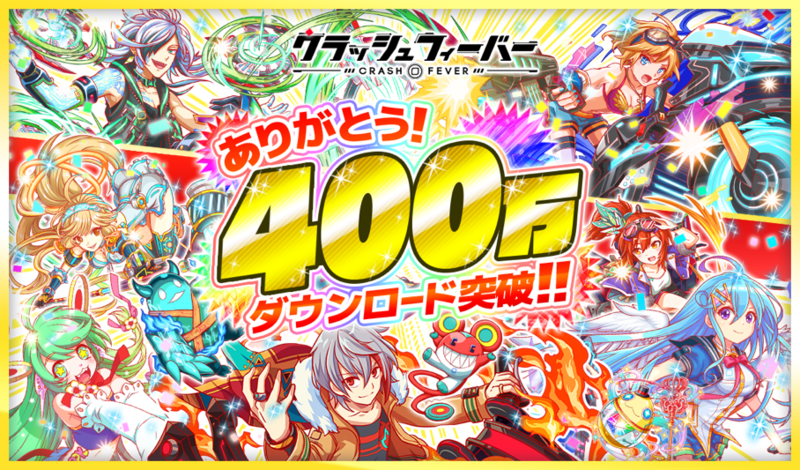 Crash Fever has reached over 4 Million Downloads – We will be celebrating by running 10 HUGE events from June 23rd – | WonderPlanet Inc.
NAGOYA, JAPAN-June 22, 2016 – WonderPlanet Inc. (Director & CEO: Tomoki Tsunekawa) announced that puzzle RPG Crash Fever has been downloaded over 4 millions, and to celebrate this milestone, we will be running our “4 Million Downloads Celebration” from June 23rd. 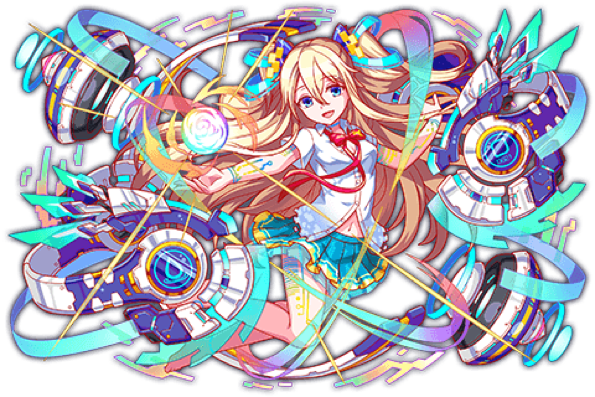 Crash Fever’s inviting virtual world provides a simple yet exhilarating game experience, where you break panels with a touch of your finger while listening to an awesome soundtracks. Both the gameplay style, consisting of “accumulate, accumulate, then CRUSH all the panels in one go,” and a feeling of exhilaration, which along with our comical TV commercial have helped make this game a popular talking point. At the time of writing, our official Twitter account has reached over 150,000 followers. During the “4 Million Downloads Celebration”, we will be launching a whopping 10 events giving both new players and veterans a chance to get polygons, play the 4 Million Downloads Blowout Event, get unit-enhancing materials, and more! Log in for a polygon! Get up to 7 in total! Get a polygon on each day you log in to the app during the distribution period! – Polygons will be distributed every day at 3 PM. 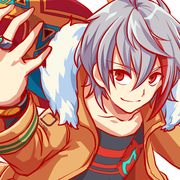 – Only players who log in from 3 PM on June 23 (Thu) – 2:59 PM on June 30 (Thu) are eligible. 4 Million Downloads Blowout Event “With Love, From Million Duck IV”! A one-time only Million Duck drop loot! Use it for a ton of EXP, or sell it for some serious bittage! Get keys to locked quests during the week! Get your hands on Locked Quest Keys that give you access to locked quests! We’ll be giving you an Experience Key, a Bit Key, and a Limit Leap Key during the event every day when you log in to the app! – Locked Quest Keys will be distributed every day at 3 PM. Attention newbies! It’s a double-EXP event for normal quests! Gain double the EXP for all the normal quests from Entering the Mainframe (1) to Candy Cottage (16)! Grab a bunch of EXP points and boost your rank! Duck Hunt Operation and Gold Casino (Easy) always available! The easy-level guerilla quests Duck Hunt Operation and Gold Casino will be playable for the entirety of the event! Acquire awakening skills and limit leap material with the quest Apples Everywhere! Apples Everywhere! is a special solo quest, where you can get skill-awakening and limit-leap material! Introducing the EXP-fest: After Metal Ducksworth! This timed guerilla quest (solo only) After Metal Ducksworth! is one for the experts. Run into metal ducks or rarer units on every floor, and maybe even multiple Metal Ducksworths if you’re lucky! Weekly missions are going into overdrive during the event period! Clear missions to get fabulous items! Wizard-level quests or higher are provided every day! Qilin, Odin, Nobunaga Oda, or Lucifer enter the fray throughout the event! 4 Million Downloads Celebration Extravaganza! 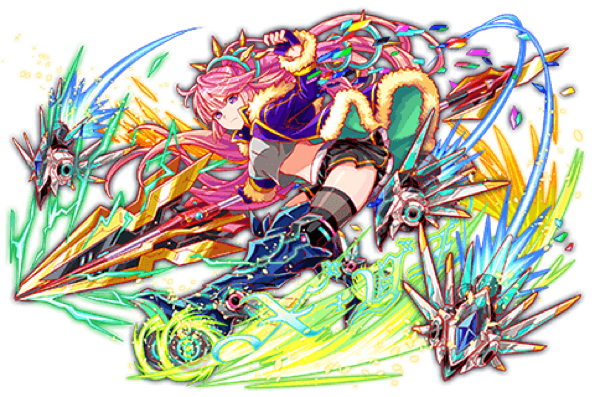 – All limited-edition units shown above are post-awakened 6★ forms. – Limted-edition units are not attainable at 6★.